Can I take pictures on a commercial airplane? It's a question commonly asked by camera-toting travelers, who are unsure of federal aviation regulations. Can I Take Pictures on a Commercial Airplane? Transportation Security Administration (TSA) workers and flight attendants are no strangers to the query: "Can I take pictures on a commercial airplane?" The short answer is yes. Whereas the events of September 11, 2001 temporarily banned airline passengers from taking pictures in commercial aircraft, as of April 2010, there are no Federal Aviation Administration (FAA) regulations that restrict still photographs on airlines. While there are no existing FAA rules prohibiting still photography on airplanes, if your flash disturbs other passengers, flight attendants may ask you refrain from using your camera to snap photos. In such cases, federal regulations require that you follow the instructions of flight attendants during your flight. 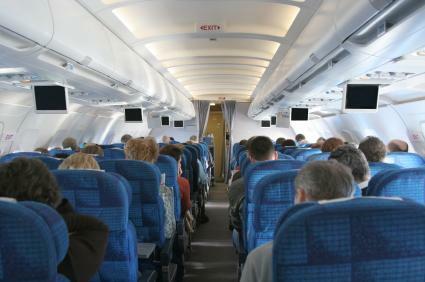 In most cases, you can take still photos on a commercial aircraft without fearing that you will get into trouble. However, there are different rules for different types of cameras. Video cameras are one of the most popular electronic devices brought onboard airplanes. Most travelers are anxious to document their trips, especially if the flight is a special one. For example, if your child is embarking on his first commercial flight to grandma's house or you and your just-married spouse are jetting off on your long-awaited Hawaiian honeymoon, you are going to want to capture the momentous occasion on video. If you plan to record special moments on a commercial airliner, you should know that there isn't an all-encompassing ban on video camera use throughout the industry. The FAA doesn't have specific regulations stating that taking video images inside a plane or out an aircraft's window is illegal. However, individual airlines have the right to set and enforce their own rules regarding the use of video cameras on their planes, whether they are on the ground or in the air. Moreover, individual flight attendants have the right to restrict the use of any digital media. Passengers are required to do what the flight crew says under FAA regulations. If you do not comply with the wishes of the individual carrier, you are subject to penalties ranging from paying fees to being escorted off the flight. The FAA prohibits in-flight use of wireless devices, including camera phones, because of potential interference to the aircraft's navigation and communication systems. The FAA also regulates the use of all portable electronic devices, such as iPhones, Blackberries, and other image recording devices in commercial aircrafts.Most major commercial airlines prohibit the use of cell phones during take-off and landing. However, passengers are able to use cell phones to make calls and take photos while the airplane is on the ground. Several carriers allow cell phones equipped with a feature called a "flight safe mode" to be used during the flight, as studies have shown that this particular mode does not interfere with the aircraft's navigational instruments. Flying on a commercial airplane can offer photographers excellent opportunities to take amazing aerial and landscape photos. However, you don't want to jeopardize your trip by taking photos on an airplane when you are not allowed to do so. Spare yourself from a potentially embarrassing situation by checking with your carrier about photography rules before taking off. Since airlines have the ability to restrict the use of video cameras and camera phones during flights, don't assume that because you were able to shoot photos on one airplane, you can do so on another carrier.